December 3, 2014 – PPC Technologies & Solutions LLC (PPCTS) the USA and Canada distributor of DGM Folding Carton and Corrugated Specialty Folder Gluers (DGM) and IMPACK Packaging Folder Gluer Packing and Ancillary Systems (IMPACK) has recently opened a new Demo and Technology Center in Waukesha WI. The new Demo & Technology center is now operational with the recent installations of a DGM Smartfold 1100SL Folding Carton Folder Gluer that includes an inline IMPACK Ergosa 8C Universal Folder Gluer Packing system and IN3.0 Carton Turner. 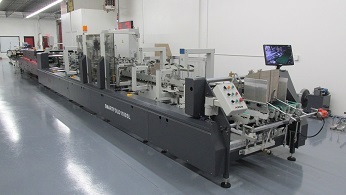 The demo center's DGM Smartfold 1100SL Folder Gluer is equipped with servo driven feeder, left and right blank side register, pre-folding, crash lock, 4&6 corner servos, left and right lower glue pots, servo driven trombone, trombone and compression section blank squaring devices, servo driven compression section with 3.5 meters of effective pressure length, as well as motorized carriers with memory job recall and many additional features. The IMPACK Ergosa 8C Universal packing system is configured with an IN 3.0 Carton Turner, MAE front & back packing stations, Perpack backside packing unit and 4FF four flap case closing. Richard McDonald, President of PPCTS, says, “the opening of our 6000+ square foot Demo & Technology center is a major investment and a testament to our commitment to offer competitively priced high performance equipment solutions to the folding carton and corrugated industries. Our customers and prospects will now have the opportunity to demo DGM and IMPACK equipment prior to making a purchase decision. As we move forward into 2015, we are also planning to unveil, at our Waukesha WI demo center, new IMPACK packing solutions and technologies that will complement the DGM Megafold line of Corrugated Specialty folder gluers and also add to our current folding carton packing offerings"
DGM is one of the leading manufacturer of folding carton and corrugated specialty fold gluers in the Southeast Asia and China markets. DGM counts machinery installations in over 25 countries with more than 5000 units sold, and a steadily growing export presence that include the America's, as well as Eastern and Western Europe. IMPACK specializes in folder gluer auxiliary equipment for manufacturers of folding carton, micro-fluted and corrugated packaging. They offer innovative solutions in the area of ergonomics, productivity and workplace health and safety. PPCTS is a supplier/distributor, manufacturer and manufacturer’s representative of quality products and equipment for the packaging, printing and converting industries. PPCTS offers a “systems approach” to equipment needs and production requirements, with customer specific solutions and over 30 years of industry experience.